It was dark and I was asleep in my room in Africa 5 Room 26. An irritating smell woke me up from my deep sleep. I looked at the clock. It was 4 hours. My roommate also woke up. The pungent smell got stronger. My nose, lungs and my eyes were irritated. I opened the balcony door to find out the source of the pungent smell. Other students were also on their balconies of the 4 floors of Kwacha Hall next to Africa Hall. They were shouting asking what was happening. “It’s tear gas! !” someone yelled. “The mobile police guards just outside the wall must have tossed tear gas over the wall!! !” another student shouted. “Bafi……….“ the student shouted to the mobile police an insult in Bemba. This was at University of Zambia in February 1976. We had been demonstrating on campus and holding sporadic boycotting of classes for a week. The previous afternoon, the mobile police were deployed to campus to quell some physical altercations and incidents between demonstrating students. At one point the platoon of mobile police with their guns were advancing toward International and President Halls of residence in coordinated military advance attack formation. We students recognized the formation because we had all been to National Service training. Suddenly the platoon was given orders to back off. That night armed mobile police guards surrounded the entire campus. No student or anyone could enter or leave campus. The government announced early the next morning that the University of Zambia was closed due to student unrest. We later concluded that the tear gas incident must have been a rogue act of a bored lone mobile police guard who wanted to punish we comfortably sleeping students by throwing probably one tear gas canister over the wall behind Africa Hall. No other students on campus had such a tear gas experience that night. When Two UNZA Students Died. 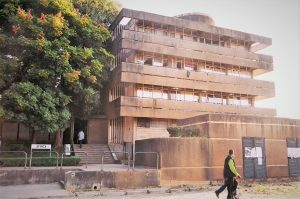 One Sunday morning at the University of Zambia campus in 1975, news spread like wild fire that a female student in Zambezi Hall had suddenly died in her sleep. The cause of her death was not known. The University administration and UNZASU organized for her body to be driven to her Luanshya hometown for the funeral and burial. About 50 students including myself volunteered to go to the funeral in the large UNZA bus. About 20 kms from Luanshya the bus pulled over to the side of the road. We all went into the bush to collect firewood which would be part of our contribution to the funeral wake. We hoisted the firewood on top of the bus. When we arrived and pulled to the house of the deceased student’s parents, the modest small house yard was full of mourners; many already cooking and setting up fires. I will never forget the haggard look of the student’s mother. She was wailing in a voiceless hoarse voice once she saw us walking out of the UNZA bus one by one. She was wearing a black duku around her head, a black dress, and a chitenje. “Abanankwe nabesa!!! (Her friends have come!!) she wailed flaying and throwing up her arms helplessly. The sad image of her desperate grief stricken mother with a hoarse voice has been seared in my memory. The following day at the burial, Chitundu Soko, UNZASU President delivered a moving eulogy on behalf of the student body. A few months before a 4th year student was to graduate in 1976, news spread on Sunday morning on campus that the male student had been killed in a car accident in Chelston township. I had seen and said hello to that same student in the lower campus Dining Hall during supper that previous Thursday. The UNZA community was plunged in sorrow. About 40 students volunteered to go to the funeral and burial in a remote village 770 Kms from Lusaka. This was in the South Eastern part of Lundazi district in the Eastern Province toward Chief Mwase. In those days communication of urgent news about deaths was either by ZNBC radio or by telegram. There were not cell phones. We didn’t know if the relatives in the village in this remote part of Zambia would receive the tragic news before we got there with the student’s body. We travelled all night. We arrived at the village at sunrise about seven hours. A young ten years old boy took the tragic news particularly bad. He was hyperventilating as mourning descended on the entire village. The burial was at 4:00 pm. Immediately after burial, we drove all night back to Lusaka. The death of any UNZA student is a tragic loss for the student who suddenly will miss all of life’s future possibilities. It is a huge loss to the family that invests so much hope in their daughter or son. This is why I would like to express my deep condolences to the Vespers Shimuzhila family, the UNZA community, and Zambia as a nation. This is why I pray that her death will not have been in vain. UNZA students, the community, the government, and all of us as a nation should come together. We should agree to take measures that will ensure that a tragedy like this death never ever happens at University of Zambia again.